This is the fun part of the test, for many reasons. You get to rest before it, you are a little tired from the 3 previous parts and it makes you more relaxed. The examiners are trained to smile no matter what, so you feel as if you were speaking to your best friend. The first sub-part of Speaking test is an interview, which means that the examiner asks you questions about yourself, your work, studies, parents, brothers/sisters, pets, etc. This is an easy task to prepare for. In the second sub-part of Speaking test you receive a card with 3-4 questions. After one minute, that you have to think about something to say, you should give a short speech for one to two minutes, which answers those questions. In the end the examiner might ask you a couple of additional follow-up questions. The examiner will record your session on tape. Don’t worry about it; the recording is to test the examiner and not you. 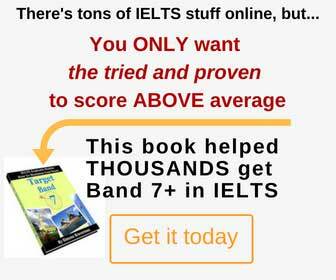 Click here for IELTS Speaking samples – listen to real students answering real IELTS questions. Is it ok for the candidates to ask the examiners say again the questions if the candidates can not hear clearly, or too low? Yes, if you let him know that the reason you are asking is that you didn’t hear well. Otherwise the examiner could think that you didn’t understand the question. I wanted to know that is it ok for the candidates to change the topic in the speaking test if the candidate has less knowledge about that current topic? That’s not black and white – they might let you change the subject because of your lack of knowledge, but they could think you don’t have the right vocabulary to speak about it – which is not good.